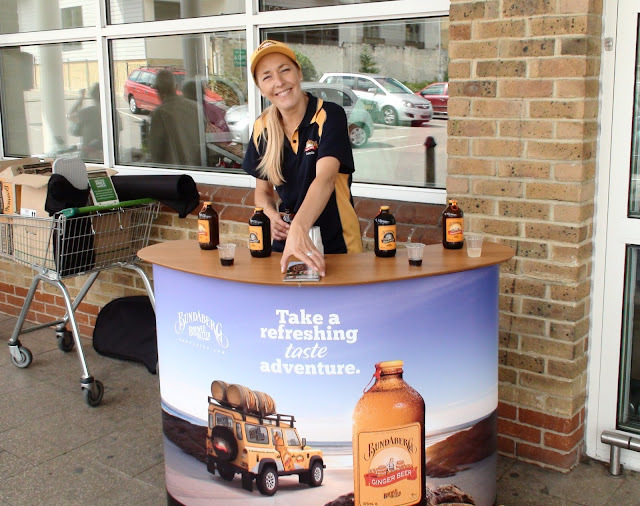 Popping into Waitrose today I had the pleasure of sampling some small drinks and chatting to Clair who is outside the store helping to promote Bundaberg Ginger Beer and Root Beer at Waitrose stores. Today is Worcester Park’s turn to have the benefit of Clair’s promotional stall. For those interested, the current promotion is if you buy 6 bottles you get an extra one for free. The promotion is running until the end of August but Clair is only there today and will be heading off around 4:30 this afternoon. The drinks are non alcoholic. Apparently the brewing process creates alcohol but the alcohol is removed to leave a soft beverage. Bundaberg is apparently working on an alcoholic version as well. I suggested they just don’t take the alcohol out, but apparently it is not that simple and they are still trying to get the flavor just right.